India will also take inputs from countries like Russia, which have designed and developed manned underwater vehicles. India will also take inputs from countries like Russia, which have designed and developed manned underwater vehicles. According to experts, the spherical module — 3.2 m in diameter — will be made of titanium that can take a three member crew about 6 km into the ocean to look for metals, minerals and study lesser known life forms. 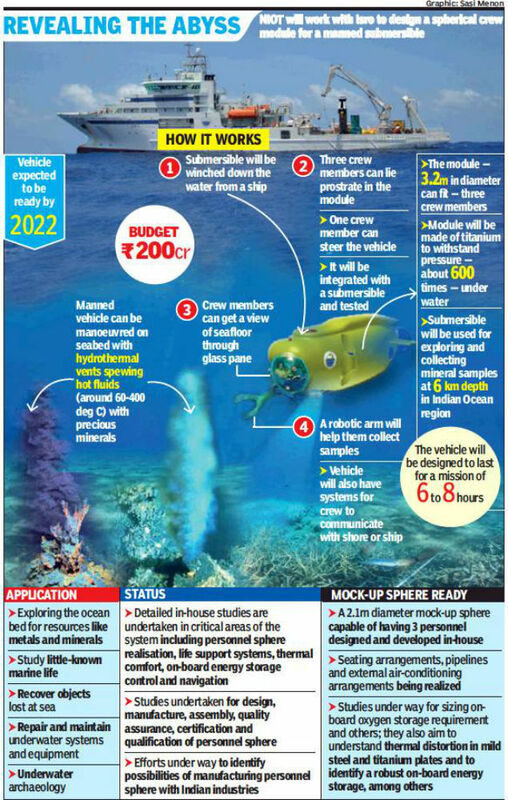 The underwater vehicle, estimated to cost Rs 200 crore, will be part of the ambitious Deep Ocean Mission, which will bring expertise from scientific laboratories in the country together and develop technologies that will be help in the exploration of resources in the ocean. India, at present, is conducting exploration for poly-metallic nodules and poly-metallic sulphides in regions of the Indian Ocean on contract with the International Seabed Authority. Rajeevan said the submersible would be most helpful when obtaining measurements on the seabed and searching for minerals near hydro-thermal vents which eject minerals along with hot fluids in tectonically active regions like Rodrigues Triple Junction in the Southern Indian Ocean, where exploration is under way.